Community development with our neighbors in Retirement is a way of celebrating God's gift of all the seasons of life and, specifically, experiences of knowing and being known by some of our closest neighbors and biggest George Fox supporters currently living in the Friendsview Retirement Community , Avamere and other neighboring communities. George Fox students and Retirement community residents come together regularly to encourage the dignity of God's image in each other primarily through building relationships and connecting generations through talent-sharing, life-experience and story-sharing (and recording), and even some fun and games. 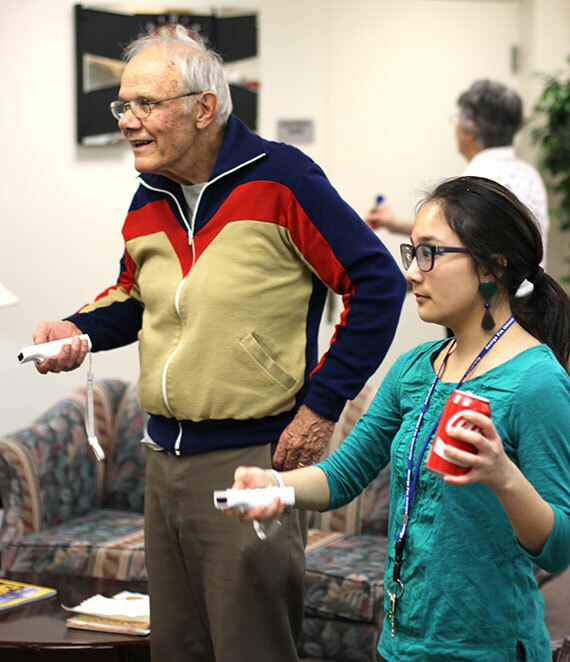 Once a month, Fox students and Friendsview residents come together to have some fun, spend time together, and listen to each other’s stories. Highlights of these events include ping pong, pool, shuffleboard, puzzles, card games, and board games such as rummikub or scrabble. Generation Connection is a program intending to bridge the generation gap that has become common in today’s society. We want to empower our community to embrace shalom by recognizing and sharing individual strengths and wisdom cross generationally. This 8 week program matches Fox students with people from partnering churches and helps them begin a friendship and mentorship. Within this context, both parties will have the opportunity to learn from and serve each other as they spend one on one time pursuing similar interests or engaging in conversation about life and faith. Applications are closed for Spring Semester.